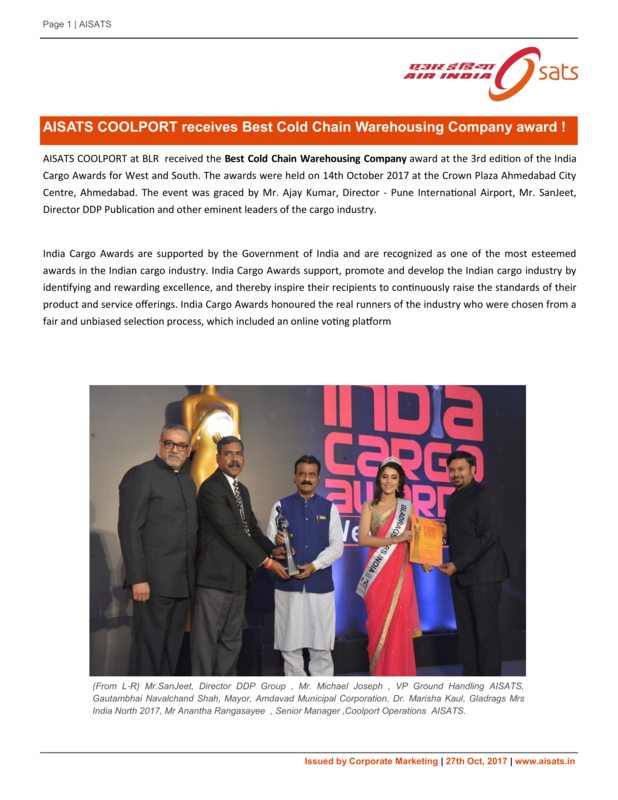 AISATS COOLPORT receives Best Cold Chain Warehousing Company Award ! Etihad Airways recognizes AISATS for Exceptional "Action in Partnership" in Ground Handling! 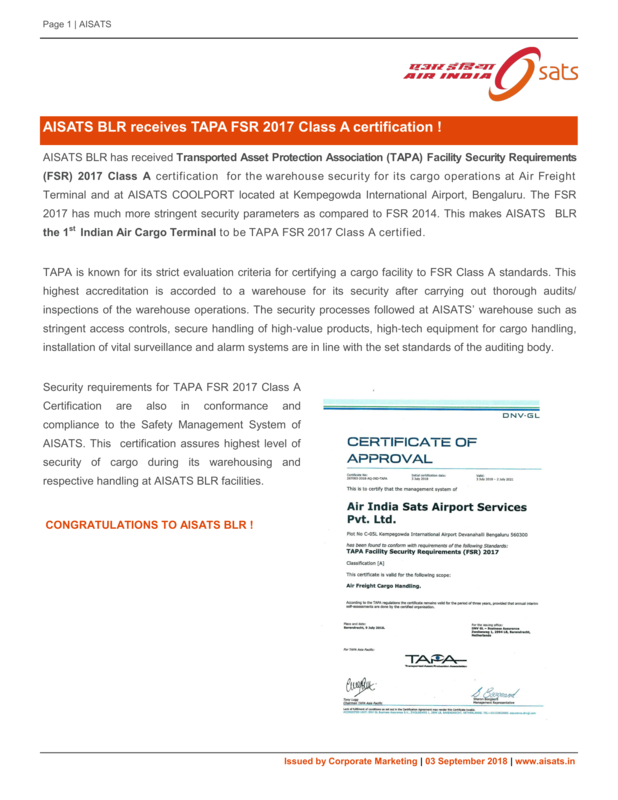 AISATS BLR re-certified with TAPA certificate! AISATS supported school at Hyderabad with Infrastructure facilities! 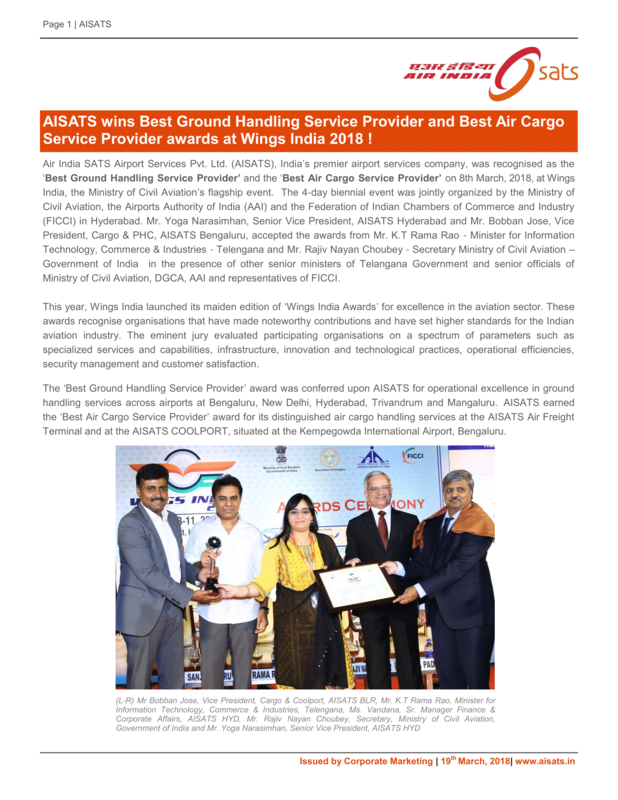 AISATS retains Top Position of "Best Air Cargo Terminal Operator"! AISATS launches 'AISATS Cargo' app for real time cargo tracking ! For Immediate Release India’s first integrated on-airport perishable cargo handling centre – AISATS COOLPORT commences Trial Operations Bengaluru, 01 October, 2016: Air India SATS Airport Services Pvt. Ltd. (AISATS), India’s premier airport services company, commences trial operations of India’s first integrated on-airport perishable cargo handling centre, “AISATS COOLPORT”, at the Kempegowda International Airport, Bengaluru (KIAB) today. The state-of-the-art, 11,000 sq. meter facility will meet the ever-increasing demands and handling requirements of temperature-sensitive cargo and will further enhance the State of Karnataka’s status as the pharmaceutical and perishables hub of India. AISATS COOLPORT, with a handling capacity of 40,000 tons per annum, will cater to an extensive range of perishable commodities such as pharmaceutical products, fruits, vegetables, poultry, sea food and flowers. It is customized to offer the most comprehensive cold storage solutions with 17 dedicated cold rooms with adjustable temperatures ranging from – 25OC to + 25OC. Designed as a “One Stop Shop” to facilitate the Import and Export processes of the air cargo industry, the integrated facility will house a state-of-the-art Drug Controller lab as well as a Plant Quarantine Inspection & Certification office. It will be supplemented by a temperature controlled queue lanes for unitized shipments and Cool Trollies to ensure integrity of the cool chain from AISATS COOLPORT to the aircraft and vice versa. In recent years, Bengaluru has witnessed a steady increase in perishable cargo volume, with a CAGR of 15%. With this new facility, AISATS aims to be a key player in promoting an efficient, safe and secure cool chain handling for temperature sensitive products. 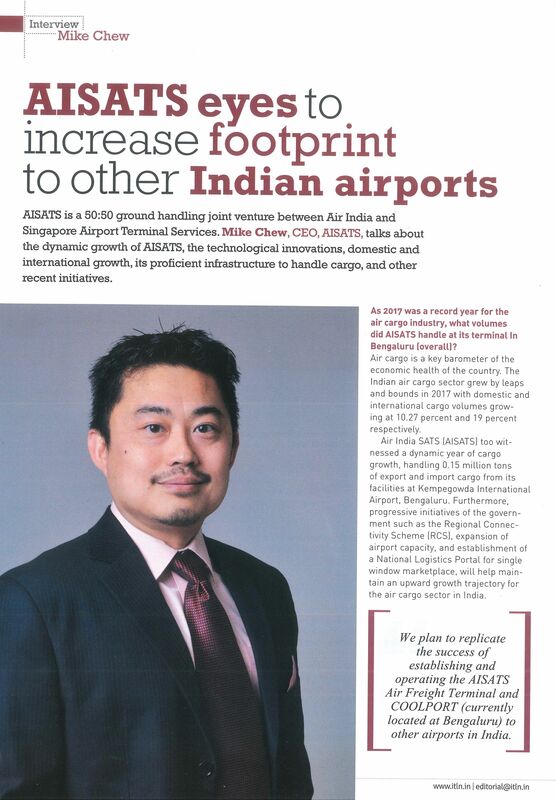 Speaking on this occasion, Mr. Mike Chew, CEO, AISATS said, “The Indian economy is on a high trajectory of growth and requires upgraded infrastructure facilities in the logistics space to cater to the growing needs of the trade and the air cargo industry. Keeping in view the significance of Air Cargo to the economic growth of the country, we truly believe that this dedicated state-of-the-art facility will play a vital role in supporting better trade facilitation, and will further boost the exports & imports of temperature sensitive products. AISATS COOLPORT at Kempegowda International Airport aims to bolster the Government of Karnataka’s vision of turning the state into a preferred air cargo hub of South India.” “Today, I congratulate AISATS on the trial operations of the new integrated Perishable Handling Center at KIAB, a first for any airport in the country. 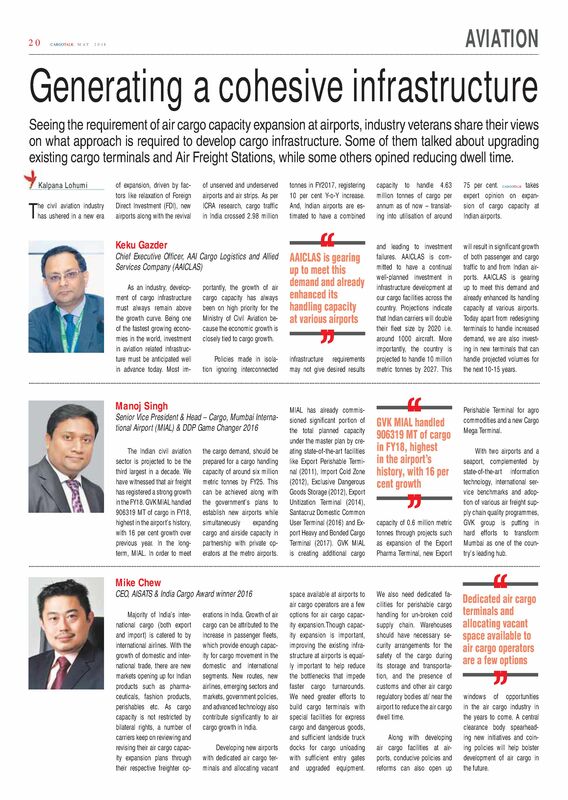 As we move towards becoming the preferred cargo hub in southern India, it is imperative for such specialized facilities to cater to the burgeoning perishable cargo demand of this region. South India with its established presence in the global logistics network has the potential to create the necessary fillip towards the development of air cargo in India. As an airport that is strategically positioned at the heart of South India, we have the opportunity to take advantage of this momentum and be the single gateway for cargo traffic and shippers aspiring to reach this fast-growing region. We firmly believe new logistics that redefine the cargo business will propel us closer to our vision of being the Cargo Gateway to South India,” said Mr. Hari Marar, President, Airport Operations, BIAL AISATS COOLPORT is expected to be officially inaugurated by end of 2016. About Air India SATS Airport Services Pvt Ltd (AISATS) AISATS is a 50:50 joint venture between Air India Limited, and SATS Limited, a leading gateway services and food solutions provider in Asia. 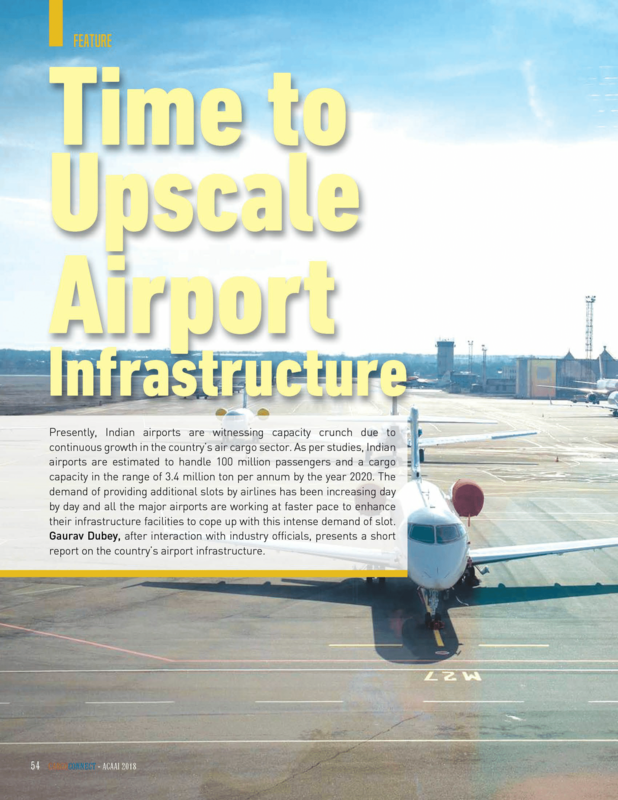 As part of the Indian Government's initiative to upgrade its airports to world-class facilities and attract more airlines to fly into India, AISATS was formed with the vision to provide world-class airport services in ground and cargo handling that exceed customers’ expectations. Since the start of its operations in 2008, AISATS has provided hassle-free and comprehensive solutions to its customer airlines in international airports at Bengaluru, Delhi, Hyderabad, Mangalore and Trivandrum. Currently employing over 7,000 staff, AISATS offers end-to-end ground handling services such as passenger and baggage handling, ramp handling, aircraft interior cleaning, load control and flight operations, and cargo handling services for general, perishable, transshipment, express courier and special cargo. AISATS wins the esteemed ‘Best Air Cargo Terminal Operator’ Award for the fifth consecutive year Bangalore, March 30, 2016: Air India SATS Airport Services Pvt. Ltd. (AISATS), India’s premier airport services company has been awarded the ‘Best Air Cargo Terminal Operator’ award for the fifth consecutive year by the Indian Chambers of Commerce at the ICC Supply Chain & Logistics Summit & Awards held at The Park in New Delhi. Mr. Ariffin Hussein, Assistant Vice President – Cargo Operations, AISATS BLR accepted the award on behalf of AISATS from Shri Sanjay Mitra, Secretary, Ministry of Road Transport and Highways and Mr. Shiv Siddhant Kaul, President of the Indian Chamber of Commerce in the presence of honorable panelists, representing various facets of the industry.